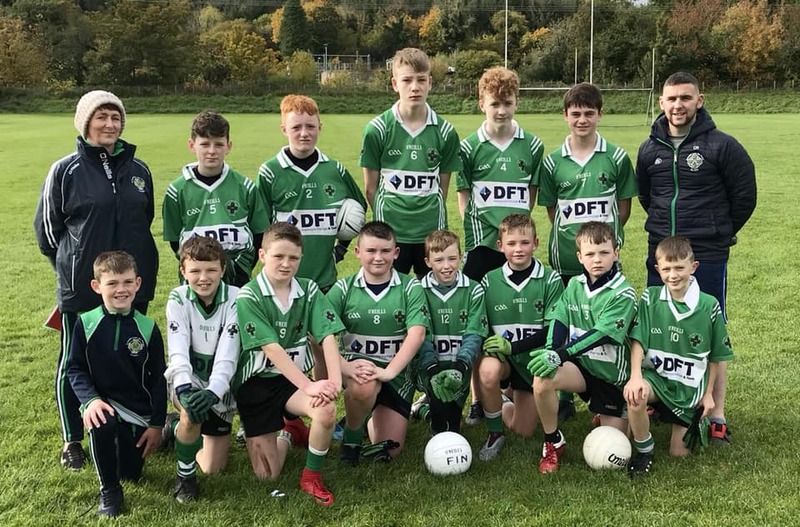 *Our U13’s made it two wins from two games in the championship to top their group and are assured of a place in the semi finals with home advantage. They saw off the challenge of Carryduff B at Pairc Baile Anna on Sunday morning. An impressive first half showing saw the Fin take some great scores with Ryan McCann bagging the first two goals. Points followed from our U11 players Marty Og Flanagan, Ryan Croskery and Caolan Flanagan, Flanagan also hitting the net. Dualta Pickering and Niall Dornan also grabbed a goal apiece and the captain Conor Walsh sent over some great points as well. The defence was equally impressive with Odhran Murray coming in for the absent Jamie King and Ryan Croskery in for David Steen and both did very well indeed. Ryan Quinn was the other starter in place of the injured Conor O’Hare. Half time Aughlisnafin 5-09 Carryduff B 0-2. In the second half the management team moved the players about positionally and Carryduff played much better to score 3-2, but the Fin added a further 5-5 to win the game. Defenders Joseph Steen and Reece Tweedie grabbing goals with Conor Walsh goaling direct from a superbly struck ‘45. Niall Dornan and Dualta Pickering also getting their second majors. Further points from Ryan McCann, Caolan Flanagan, Marty Og Flanagan and Conor Walsh put the icing on a great team performance. Best wishes to Conor O’Hare who was unable to play through injury. Hope to see you back soon. Aughlisnafin U13’s who have reached the championship semi final after a superb win over Carryduff on Sunday morning. *The Juvenile Presentation Night saw the biggest attendance in years as the numbers of juveniles in the club have grown year on year. Full report in next week’s notes. *Dolen Croskery has been appointed as the new manager of Aughlisnafin seniors for 2019. Dolen will have Connor Rea alongside him as the fitness coach / nutritionist. The selectors will be confirmed in the coming weeks. We are very pleased to have Dolen on board. Dolen has previously managed our clubs U16s in 2016 & 2017 and has aided the development of our underage players. This appointment is viewed by the executive committee as a natural progression in terms of utilising the clubs own resources insofar as possible and building on the clubs excellent underage coaching structures. Also we are pleased to have Connor involved. He is well known on the local fitness circuit and his experience in strength and conditioning will prove invaluable. A meeting with the new management will be arranged next week. New players welcome to attend. We thank the outgoing management team, manager Willie Megoran, coach Gerard Lenaghan and selector Gerard O’Hare for all their efforts in the season past in what has been a memorable year in which we secured a top four league finish, reached the semi final of the JFC and were the Junior Feis 7s runners up. Gerard Lenaghan and Gerard O’Hare will continue in their role with the Baile an Locha Minors, along with Willie & James Laverty from the St Johns club and we wish them every success for the 2019 season. *The Annual Club Dinner & Awards Presentation Night will be held in Downshire Arms in Hilltown this Saturday at 7.00 pm. All senior and minor players are invited to attend. The minors will be presented with their East Down Feis 7’s and All County Feis 7’s winners medals. The East Down Board chairman, Ger Connery, is the guest of honour. *Lotto numbers 5, 12, 13, 24. No winners. Jackpot £3,900.